Figure A: SCP-1636, original documentation from [REDACTED] in 1998. Special Containment Procedures: SCP-1636 is currently stored in Sector-41, Vault 67-A. SCP-1636 is to be the only object kept in Vault 67-A at all times. SCP-1636-1 and SCP-1636-2 are to be kept in the same case as SCP-1636. SCP-1636-3 should be locked in Safe 67-B at all times. A minimum of two (2) guards with security clearance Level 3 should be positioned at the entrance of Vault 67-A. Besides emergency circumstances, SCP-1636 is only to be removed for testing purposes. All requests regarding removal from Vault 67-A for testing purposes should be directed to Dr. Rathwell. Emergency Containment Procedures: In case of emergency, non-electronic, non-sentient items may be temporarily stored with SCP-1636. Should the objects in question need to be removed from Vault 67-A, minimum optimal containment is a concrete cell three (3) inches thick. The safe containing SCP-1363-3 is small enough and light enough to be carried out of Vault 67-A. This should only be done in severe emergencies. The safe is chained onto the pedestal upon which it stands. Personnel guarding the vault must carry the key to unlock the chains binding the safe with them at all times while on duty. WARNING: No electronic devices of any kind are to be brought within 20 m of Vault 67-A. Anyone found to be carrying an electronic device within this range will be terminated. Security officers guarding Vault 67-A have full authorization to terminate individuals that are carrying electronic devices within this radius, or who physically attempt to enter Vault 67-A without authorization. Description: SCP-1636 is a Nintendo Virtual Boy game console with no visible differences from non-anomalous Virtual Boy consoles when OFF. It is stored in the case it was originally found in (Figure A). 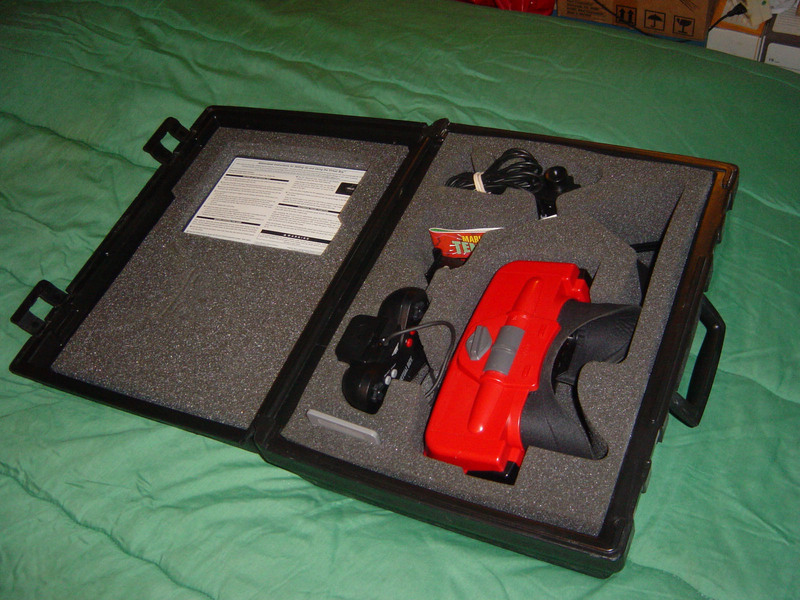 Three Virtual Boy ROM Cartridges were found in the original casing. SCP-1636-1 is a "Mario's Tennis" game pak. SCP-1636-2 is a "Virtual Boy Wario Land" game pak. SCP-1636-3 is an untitled game pak. SCP-1636 is stored in Safe 67-B, a small safe kept within Vault 67-A. When not in use, SCP-1636 only affects electronic devices. Electronic devices brought within a 15-20 m radius of the objects will react in unpredictable ways, including turning off if in use, turning on if not in use, [DATA REDACTED]1. For in depth reports on such effects, see 1636-1. See Addendum-1. When in use, anomalous effects depend on the game pak used. Testing is ongoing. See Addendum-2. The objects are to be tested in Sector-41's Research Lab 36-0 by Class D personnel only. SCP-1636-1: Testing of SCP-1636-1 showed no anomalous properties. While SCP-1636 was on, with the SCP-1636-1 cartridge in place, the effects discussed in 1636-1 occurred. As previously mentioned, these effects are displayed regardless of whether SCP-1636 is ON or OFF. D-████ reported that the game "played normally". No unusual discrepancies were noticed in D-████'s condition or in SCP-1636. SCP-1636-2: During testing, initially showed no anomalous properties. However, once the game began, the screen of the visor went black. It remained black for roughly 3 seconds before a 3D view of a labyrinth appeared on screen. The labyrinth was described by D-████ to be "almost lifelike". The processing capacity of SCP-1363 should be nowhere capable of producing such images. The test subject continued, describing himself as "walking through the labyrinth". D-████ soon reported witnessing a "wolf-like creature" within the maze, and was soon after attacked by it in the virtual world. At that point, physical wounds appeared on D-████'s body. Testing was immediately halted when D-████ fell to the floor. D-████ succumbed to his wounds approximately 8 minutes after the initial attack, and SCP-1636 was only switched to OFF 4 minutes after the initial wounds appeared. After examination, the wounds were officially documented as being synonymous to wounds typically inflicted by Canis lupus. SCP-1636-3: When SCP-1636-3 was switched into its ON position, anomalous effects were immediately noticed by D-████. D-████ reported that the images on the screen were the exact images he would be seeing if he was not wearing the object's visor. D-████ was ordered to attempt to move within the virtual reality. [DATA EXPUNGED]2. D-████ was immediately terminated, and SCP-1636-3 was placed within its current containment unit. See Addendum-O5-█. Addendum-O5-█: It is clear that the improper and immoral use of SCP-1636-3 could lead to an emergency situation, with the worst case scenario being a mass breach of multiple Euclid class entities currently in containment. Removal from Sector-██ to Sector-41 has been scheduled for ████-██-██. Addendum-1: Access to 1636-1 is only available to personnel assigned to SCP-1636, or individuals with minimum security clearance Level 3. 1. Effects range from "playful" phenomena such as turning on and off, to much more malevolent phenomena including leaking of battery acid, and explosion. Within file 1636-1 are details of experiments in which various electronic devices were brought into SCP-1636's effective range. 2. When the D-Class moved and acted within the virtual world, real world effects were seen. The D-Class from within the game was able to open the door to the lab. An individual with the intention of causing a massive breach could do so using this object while remaining in a safe location.